Come, O my Beloved, come and take possession of my heart; I long for Thee; I sigh for Thee. Come, Lord Jesus, come! 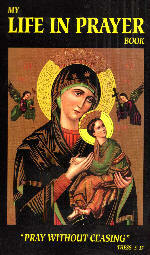 Most holy Virgin, and my Mother Mary, behold I already approach to receive thy Son. Would that I had the heart and love with which thou didst communicate! Give me, this morning, thy Jesus, as thou didst give Him to the shepherds and the kings. I intend to receive Him from thy pure hands. Tell Him that I am thy servant and thy client, for He will thus look upon me with a more loving eye, and now that He is coming, will press me more closely to Himself.